This shirt is guaranteed to be completely impervious to Persian arrows. The Spartans are perhaps the most famous warrior culture the world has ever known. Spartans shunned comfort for security. It was thought that a life of hardship created a warrior culture that would be unparalleled on the battlefield. Women were given training almost identical to the men. Spartan women were thought to only bear strong warriors when they were trained soldiers. They also represented the defensive force of Sparta when the males were on campaign. Sparta was never invaded and while all of Greece lay conquered (first by Macedonia and later by the Romans) no foreign army ever crossed the borders to Sparta. The Greeks were not a unified people. Fiercely independent, each city-state refused to give up it's individuality but they were unified temporarily in an act of ultimate defiance against the Persian Empire a land empire rivaled by few. Greece's individualism ultimate lead to their undoing. Spartans and Athenians grew further apart and the tensions finally erupted into a full scale civil war with other city-states choosing sides. While the Spartans eventually won a victory, both city-states had exhausted their resources trying to defeat one another that they became shadows of their former glory. A man named Phillip the Second and his son Alexander descended from the North and conquered what remained finally bringing Greece together under one empire. This new unified Greece under the leadership of Alexander went on to conquer all of Persia creating the largest Empire the world had ever seen. This forced unification and lead to a sharing of cultures that gave rise to the mighty countries that would grow after the death of Alexander and the dissolution of the Kingdom of Macedonia. 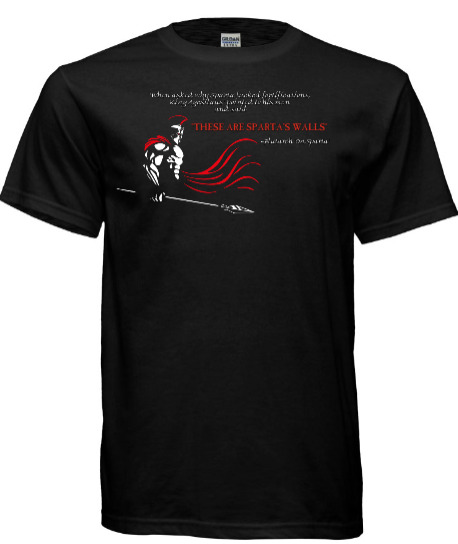 This is a Gildan, classic fit, heavyweight preshrunk cotton unisex shirt.